It's been 10 years since the Department of Homeland Security (DHS) started up operations. During that decade, DHS has moved to the forefront of funding and deploying the robots and drones that could be coming soon to a neighborhood near you. DHS funds research and development for surveillance robots. It provides grant money by the hundreds of thousands to police agencies to buy their own. And sometimes it's bought and deployed robots -- for their skies, the ground and the waters -- of its own, usually concentrated along the border. It's not clear how many of those robots police operate, and law enforcement isn't by any means the only domestic market for the 'bots. But the trend lines point toward more robotic spy tools for law enforcement in more places -- with more DHS cash. 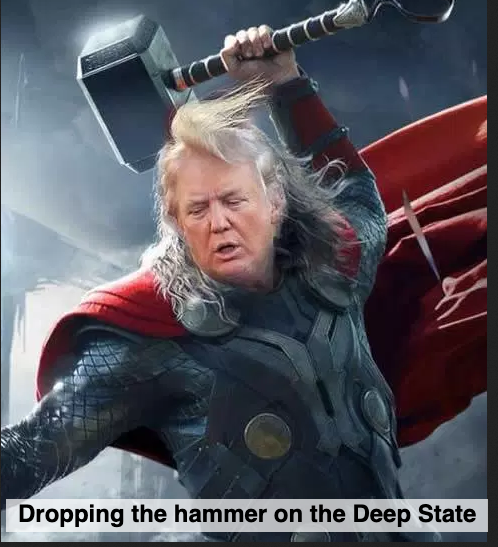 But it's not going to be simple. The Federal Aviation Administration is cautious about opening the skies to unmanned vehicles -- so much so that Congress and the Obama administration ordered it to ease up on restrictions by 2015. But not all spy robots fly. DHS is also developing robots that resemble fish, and deploys tunnel-bots deep into drug-smuggling tunnels along the border. Unarmed Predator surveillance drones inside the United States have had a rocky history. The Department of Homeland Security's sub-agency, U.S. Customs and Border Protection (CBP), has flown them off-and-on along the U.S.-Mexico border since 2004. Flights were suspended in 2006 after one of them crashed in Arizona, and drone flights were suspended again in 2010 after a Predator lost communications with its operators. At one point, drone boosters in Congress allocated funding for more drones than CBP had people to fly them. How things have changed. In the past two years, DHS expanded Predator flights into the Caribbean to hunt for drug traffickers, and has taken to using the drones in an ad-hoc program to help out local police agencies, such as during a June 2011 standoff between SWAT officers and alleged cattle rustlers in Washington state. The drones have been used more broadly than that, reportedly assisting in police investigations from the Midwest to Texas. 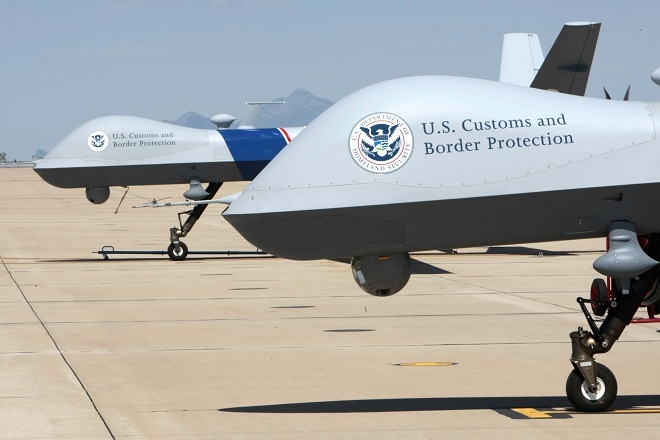 DHS has also gotten around to expanding its drone fleet. In November, DHS was revealed to be planning to expand its inventory of 10 Predators to 24, and is constructing a testing ground for small surveillance drones at Fort Sill, Oklahoma. But in the years to come, the Predator is likely to have a numerically more marginal role as more law enforcement agencies join the drone bandwagon -- it's exceedingly likely the Predator will remain an exclusive item for the federal government. That is, a federal government putting the machines to work snooping on domestic turf. Catch it if you can. In September, the Department of Homeland Security's Science and Technology Directorate premiered a prototype of its tuna-shaped robot called BIOSwimmer, developed by Boston Engineering Corporation. The concept revolves around eventually deploying the swimming robot to use in port security operations, and could prove to have several advantages over human divers. For one, it can get into tighter spaces, and can work in areas that have been contaminated with oil or other hazardous chemicals that could pose a risk to human health. But mainly, it's designed to inspect ships and "flooded bilges and tanks, and hard to reach areas such as steerage, propulsion and sea chests," noted a DHS statement. The flapping motion is also designed to reduce power consumption, and the robot itself is designed with the intention of its sensors being easily swapped out between missions. 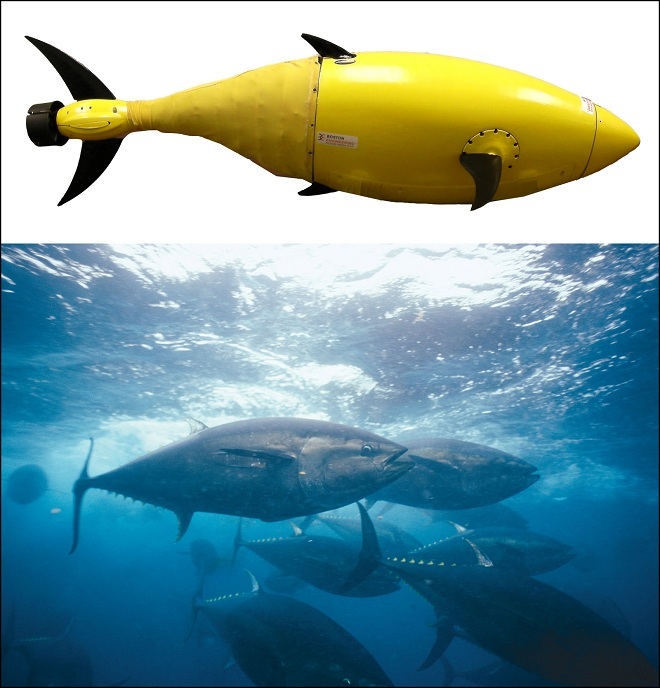 There's no public timeline for when it's expected to be deployed, if it makes it that far -- the tuna 'bot is still an experimental design. But it's generally a good idea to start on a small scale. In a way, the trials of the ShadowHawk represent why police drones remain limited, at least for the time being. The Department of Homeland Security handed $220,000 to the Montgomery County Sheriff's Department -- just north of Houston, Texas -- for one of these 50-pound helicopter drones in 2011. Aside from a mishap in which developer Vanguard Defense Industries crashed a ShadowHawk into the department's armored SWAT vehicle during a photo-op, it seemed like a great idea. The drone has a maximum speed of 55 miles per hour, a range of 15 miles, and a turbine engine powered by jet fuel that can keep it in the air for more than an hour. For surveillance, it can be equipped with a Sony FCB EX-1020 camera or a Photon 320 thermal imaging camera, and in theory would've allowed the county's law enforcement to cease relying on over-worked and tight-budgeted agencies in Houston for aircraft. In theory, that is. Actually using the drone is another question. The FAA has only granted Montgomery County authorization to train with the drone over a one-mile-wide piece of rural land in the county's northwest corner -- away from the county's built-up suburbs to the south -- and not for actual police work. The drone is also too heavy, exceeding the 25-pound limit for domestic drones set by the FAA. (The limit was 4.4 pounds until a 2012 agreement between the Justice Department and the FAA bumped it up.) That had the chief deputy in the county fuming. The deputy, William McDaniel, argued to the House Homeland Security Committee (.pdf) last summer that the FAA should be removed from overseeing and approving drone operations in the United States, "other than the regular, routine review of agency flight operations to insure [sic] flight safety rules are being followed." That doesn't sound too likely, which means Montgomery County might have ended up with a brick for a drone -- at a cost of more than 200 K's in DHS money. The past decade has seen a big build-up in border security under Homeland Security's watch, including a doubling of Border Patrol agents and hundreds of miles of fence along the U.S.-Mexico border. But to keep their wares flowing, the drug cartels in Mexico have turned to an inventive tactic: digging more and more tunnels deep underground. Then in 2008, the DHS tunnel task force -- a joint team of agents from Immigration and Customs Enforcement, Customs and Border Protection and the DEA -- got its hands on a Versatrax 150 crawler-bot, designed by Canadian robotics firm Inuktun. But the Versatrax wasn't first intended to be used for border security -- it's a pipe inspection robot more commonly used by sewage and water workers. The machine is waterproof, has a 500-foot tether cable and can travel at a rate of 30 feet per minute. A high-resolution camera can rotate in all directions, and the robot itself can squeeze through an opening as small as six inches in diameter. Border tunnels can also be dangerous places, at the risk of collapse and even booby-trapped -- with no telling who's inside or what weapons they may be carrying. 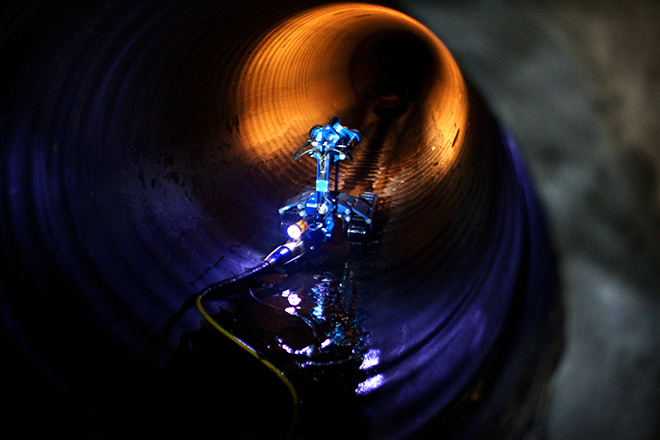 The Versatrax was designed for sludging its way through sewer tunnels, so it's not that big of a leap. The Draganflyer X6 mini-helicopter is perhaps the first police drone to see regular active use inside the United States by a local police agency. 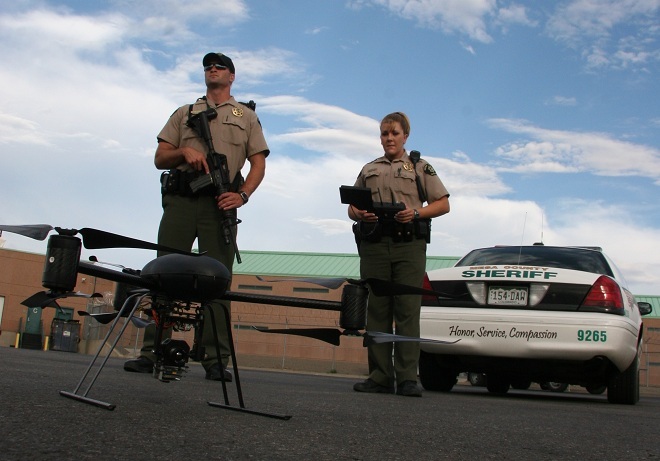 In July 2010, the Mesa County Sheriff's Office in western Colorado used funding from the Department of Homeland Security to buy one of the machines, while also becoming one of the first police agencies for the FAA to authorize using the drones for police work. Weighing about four and a half pounds, the X6 can only stay in the air under its own power for about 20 minutes, but can travel at 30 miles per hour -- allowing it to travel about six miles in one go. The drone packs either a Panasonic DMC-ZS20 camera or an infra-red thermal imaging camera, and can transmit video (when it's not recording) in real-time back to an operator. The camera is stabilized against vibration, and a sensor head made of carbon fiber contains the gyros, accelerometers, GPS receiver and a barometric pressure sensor to keep it in the air. Mostly, the sheriff's office claims it uses the drones to map out crime scenes and traffic accidents, although the office claims (.pdf) it's been used to help a SWAT team track an armed suspect, and photograph a minor airplane crash. Meanwhile, the DHS provided more than $80,000 to the Seattle Police Department for a pair of X6 drones. The department claims it intends to use the drone for criminal investigations and search-and-rescue operations. But Seattle hasn't yet been approved by the FAA to use them in actual police work beyond training officers in how to fly it, and it hasn't made it this far without objections from civil libertarians. On Feb. 4, Seattle City Councilman Bruce Harrell proposed legislation to prohibit the department using its drones for "general surveillance" -- that is, spying on anything or anyone other than an individual suspect with a warrant.